A highway, especially in a mountainous country like Bhutan is woven with the combinations of both curves and straights and we shall have to adjust our steering wheels in accordance with those curves and straights or else we will have to compulsorily confront with a death-defying leaps and jumps for our own survival. Be calculated. Be An Adaptive Enthusiast. The story dates back to Jean Baptiste de Lamarck's (1744-1829) theory and Charles Darwin's (1809-1882) Natural Selection vis-a-vis the evolution that occurred as a result of adaptation to new environments. Lamarck-ism and Darwinism are an article of faith with me to completely authenticate that; "When we are no longer able to change a situation - we are challenged to change ourselves," as quoth by Viktor E. Frankl. Think thoughtfully that circumstances awfully depend upon the perception we think and drink, so is our life. According to Lamarckian theory, it states that an organism has the ability to pass on its hallmarks to its offspring. His theory is customarily displayed through the giraffe's evolution for having longer neck and legs. 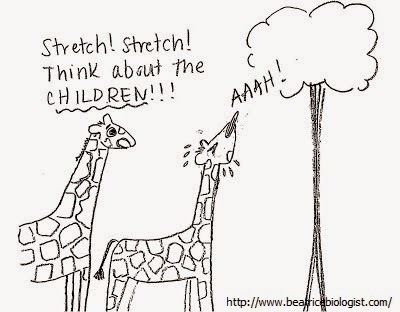 Accordingly, the giraffes had short necks but during an abysmal season when all the vegetation in lower areas were exhausted, the giraffes were forced to stretch their necks to reach food on tall trees and consequently, their necks become longer through the Law of Use and Disuse. The longer necks acquired through this basis would then be passed to their offspring through the Law of Inheritance of Acquired Characteristics. Through continued stretching, step by step, over the generations resulted to today's long-necked giraffes and evidently, we can see them. According to Darwinian theory, it states via Natural Selection that all the species of organisms arise and develop through the natural selection of inherited variations that increase the individual's aptitude to compete, survive and reproduce. Natural Selection is the process by which organisms change over time through change in their heritable physical or behavior traits for adaption. This adaption allows an organism for its survival. Accordingly, the giraffes had necks of varying lengths, some longer and some shorter due to the Law of Variation. During abysmal season when there was no much nutrition available on the lower ground for short-necked giraffes, they died off disabling their reproduction, while those long-necked giraffes could survive and reproduce, passing their long-necked trait to their offspring (Natural Selection). Over generations, resulted to today's long-necked giraffes and plainly, we can see them. Though the two theories seem bit asymmetric, as long as they serve their purpose it doesn't matter much, for both Lamarck-ism and Darwinism, are aiming for the North Star. They are just like eating and breathing for living. My earth-shattering point here is; "Each new situation requires a new architecture," as articulated by Jean Nouvel. Take time to study creatively the aforementioned cute giraffe and how it used its intuition to get adapted with the environment for its survival. And it would be amazing and astonishing to feel its attainment in our everyday life. Doesn't it makes you wonder and ponder about the life we would live if we happen to adopt its way of life? That would seem, I am sure inspirational for you because it seems exceptional for me and my dear beloved soul. I am not trumpeting you all to stretch your shortish neck as the above giraffe did for its own good (and who knows your neck might become longer if you do it, if you happen to try it constantly, please do let me know, I will be too curious to know), but I am sensitizing on the situation that we must adjust it by changing our own perception towards it. Like giraffe we too are helpless and defenseless about the situation, we can't do anything about it but we aren't powerless regarding our perceptions towards it. Slowly but surely, we can acclimatize to suit the situation for Jimmy Dean said; "I cannot change the direction of the wind, but I can adjust my sails to always reach my destination." So we all too can readjust our impressions to reach our long-awaited and life-affirming expectations. I have experienced myself, felt my fondly friends and seen loving others, complaining, bellyaching the situations when the stuffs do not turn the way one wants. The funniest thing we have been experiencing is words of excuse; "It's My Fate," and this four-word defeatist catchphrase becomes the real deleterious weapon that invariably pulls us nigh to drain from high of brain and evermore keeps us distantly faraway from consummating our huge hopes and giant goals. Evoke yourself that, "It's My Fate" is no more a God's Fate, it is the self-created invisible wall that deters you from germinating who you really want to be and it's just a wall built based on your own inner-unconsciousness climate because; "When an inner situation is not made conscious, it appears outside as fate," as phrased by Carl Jung. The far-reaching problem is within us only because many of us abjectly believe that our happiness and sadness depend on external circumstances when they actually arise from within. Keep in your mind that; "The happiness of your life depends upon the quality of your thoughts," as said by Marcus Aurelius. Ultimately, to overcome the situation, we must adjust ourselves and to adjust ourselves we need to adjust our own thoughts which is the most powerful key to unlock the door of optimistic expectations. You know nature has majestically designed this universe where everything is systematized for the benefit of all the sentient being and many things are going to work as per our own thought thoughts provided we meet their expectations. All we need to do it to live positive thoughts, determinedly and believe in ourselves, wholeheartedly. But if you fail to adjust and readjust yourself, you are failing to adjust your situation and you will be one of above Darwin's short-necked giraffes dying out of starvation. When I say 'dying out' it doesn't mean that you will be truly death but it means that you will be death in terms of your dreams, you won't be able to fulfill your intentions and dedicated aspirations. Who would love one's life when desires aren't fulfilled? And if you sincerely would love to hit your target stretch your bow, stretch your neck, adjust yourself and you will assuredly hit the bulls-eye. In giraffe's case, time requirement is very high because they won't be able to stretch their neck from shortish to longish within a week or month or a year but it took generations after generations to have what they have today. When coming to our cases it would be compare-less, because we can adjust ourselves within short period of time, it may take a month or a year. By analyzing this we must be optimist and enthusiast to change ourselves as per the situations. Nature will always favor us in the direction we head. Habit and practice, are the two foundation stones if one has the lust and thirst to "Be An Adaptive Enthusiast." Indeed they are the very lifeblood of this dictum. If the giraffe had not stretch its neck everyday, the result would have been different, I mean they wouldn't have acquired long neck. As mentioned above, it is same for us, to get acclimatized with the situation repeated actions blended with enthusiasm is most for "habit is a cable; we weave a thread of it each day, and at last we cannot break it," by Horace Mann. Over and above, my dear beloved earth's folks, many a times we are being aggravated by the everyday bothersome situations those we cannot neglect and detect, once again I am borrowing Jean Nouvel's wisdom as my footnote for all of my readers that; "Each new situation requires a new architecture." The happiest masterpiece is; we have the best ability and civility for versatility. Indeed it opened my eyes to the another dimension of evolutions and adaptations. Infact every problem is mostly the internal thing or at mental level,.. We need to activate that vastness.